The Training School entitled “Photonic Integrated Circuit design training” took place in Valencia (Spain), from January 17th to 19th, 2018. 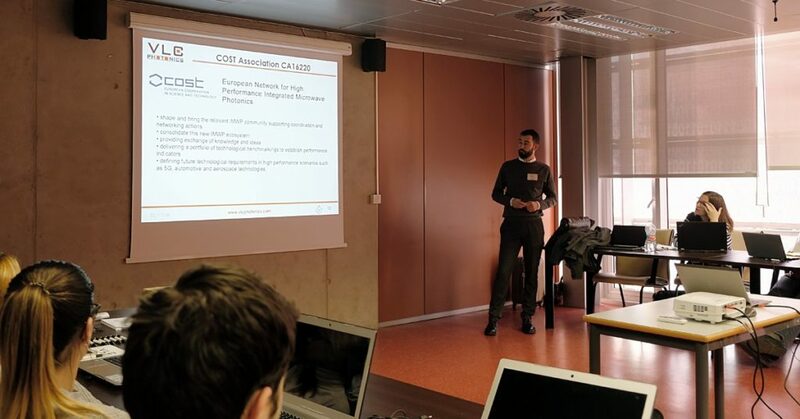 It was organised by the company VLC Photonics, as second edition, in the facilities of the Universitat Politècnica de València (UPV). The COST Action EUIMWP (CA 16220), chaired by Prof. José Capmany (UPV), offered a grant to the non-local trainees, who came from Greece, Ireland, the Netherlands, Slovenia and Spain. All of them (a total of 15 trainees) were Early Career Investigators or young industry representatives. The students were given the opportunity of fabricating the designs they have done or initiated during the training at an upcoming silicon nitride multi-project wafer run in CNM.